Mayor Michael Bloomberg’s controversial ban on large soda was overturned on March 11, by Justice Milton Tingling of State Supreme Court in Manhattan. Bored with beets? Try combining them with avocados. The combo is well worth a try, because beets and avocados are a health blockbuster. Cut your prep and clean-up time, with this simple veggie combo. If you’re in a hurry, or don’t like spending alot of time in the kitchen, this is for you. Cooked: remove tails, leave skins intact, slice and steam the beets. Serve. Raw: remove tails, peel the skins, grate and serve. Raw: remove tails, peel the skins, and crank them through a Veggie Spiralizer. Serve. For added zest, squeeze a fresh lemon over the beets, add salt and serve. Or, use apple cider vinegar instead of lemon juice. Peel, remove seed, slice avocados and serve alongside beets. Peel, remove seed, and mash avocados just as you would prepare mashed potatoes. For added flavor, squeeze a fresh lemon over the avocados, add salt and serve. Beets contain potassium, magnesium, iron, calcium, fiber, and B Vitamins. 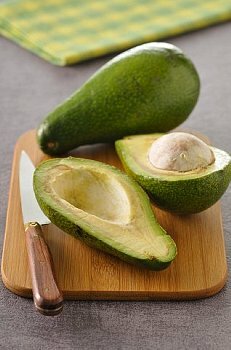 Avocados contain Omega 3 fatty acids (Oleic), antioxidants, carotenoids (antiinflammatory). Lemons are anti-biotic, anti-cancer, and an excellent source of Vitamin C. More about beet nutrition here, avocado nutrition here, and lemon here. Like they say, it’s never too late. Jonathan Mendes 93, runs marathons in New York City. He started running at 46, after quitting smoking two packs a day. He stands 5’6″, and weighs 160 lbs. He says you must have goals in life, and it’s no disgrace to fail, only not to try. Mendes got motivated to exercise after his doctor told him that he’d lose the desire to smoke, if he ever saw the diseased lungs of a smoker during an autopsy. With that, Mendes quit cold turkey. Soon after he started jogging with a neighbor, and then took to running longer distances as he got stronger. Read the full story, After 90 Years What’s Another Marathon? in the November 6, 2010 issue of the New York Times. sensitivity, wheat crust invites problems. Salt, sugar watchers, and calorie counters, need to use caution. Added toppings increase calories, and so do beverages. When they’re on the run. Contains protein, carbs, and veggies. Easy to order from home, take out, or eat in. Fun to eat, and great for parties. Seems to go well with soda pop. Many varieties for all taste buds. Good way to get kids to eat their veggies. The crust and sauce contain white sugar. Made from refined white flour. The wheat crust contains gluten. Meat contains hormones, and preservatives. Cheese pizza is high in saturated fat. High in calories. 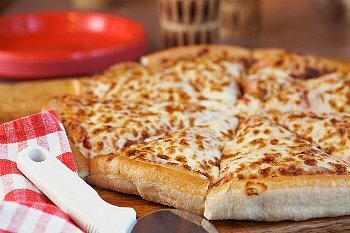 One slice of cheese pizza contains between 240 to 360 calories. Gluten-free pizza, and also here, and here. Don Antonio’s in NYC serves gluten-free pizza. Keste Pasta & Vino in NYC serves gluten-free pizza. Trader Joe’s gluten-free frozen pizza. 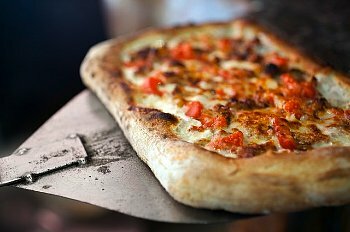 Garbanzo bean crust pizza recipe. Portion control Vegan Mini Pizza recipe. Toaster oven do it-yourself. Equipment: Exercise Ball, Sticky Mat, Athletic Shoes optional. Place a sticky mat on the floor. Place the exercise in front of your mat. Remove your shoes. Lie on your back on the sticky mat, with arms at your sides, palms down. Place both legs on the ball. Take one deep breath. Exhale fully as you lift up off the mat, balancing on the ball, as shown in Position One. Take another deep breath. Exhale fully as you lift your right leg off the ball as shown in Position Two. Slowly bring your leg down onto the ball, and change sides. Do 5 to 8 repetitions. The closer the ball to your feet, the harder the exercise. To make the exercise easier, place your calves on the ball, instead of your ankles. Lift leg a few inches off the ball, instead of 90 degree angle. Only lift your leg as far as you can maintain a steady balance. The exercise is easier if you wear athletic shoes, rather than doing the exercise with bare feet. If raising one leg is too difficult, remain in position one, and then lower your back to the mat. Use a smaller ball if you’re experiencing difficulty balancing. If you wobble, modify the exercise. Maintain level hips. As you lift your leg, don’t allow your hip to drop. Don’t overdo it! Your legs can slide off the ball, if you’re not careful. Perform this exercise in an area free of obstacles, such as furniture. Use the correct size stability ball. The smaller the ball, the easier it will be to do the exercise. See my post on selecting the correct size stabiity ball.